This week’s lesson has an agenda that is not immediately obvious in the lesson. As one goes through the week, however, the goal of the author begins to come into focus, and when one reads the Teachers Comments, the purpose is clear. This week’s lesson seeks to identify Wisdom as Jesus in order to accomplish two main goals: 1) to focus on creation as the primary foundation of belief, the event that revealed God’s intention to relate to humans through the Sabbath, and 2) to identify Jesus as the Mediator between God and Man, a role newly given to him at Creation. These two ideas are both false. Wisdom, in Proverbs 8, is personified and is shown to be an attribute of God, the entire Trinity. One of the problems inherent in the Sabbath School lesson discussion is the underlying Adventist idea of the Trinity consisting of three distinct persons, Ellen White’s “heavenly trio”, or “the three worthies of heaven”. While the quarterly never specifically talks about the Trinity as three distinct beings, that Adventist understanding is implicit. The fact that Adventists do not teach that Jesus is of the same substance as the Father but only of the same nature, purpose, and goals gives them the “permission” to speculate about how “they” felt, how things might have been different if they had switched roles, and also to speculate about how the Bible suggests Jesus took the form of an angel to interact with his creation. These speculations are pagan, not Christian. They oppose the Scriptural revelation of Jesus as the exact image and representation of the Father. They oppose the fact that Jesus took the name I Am, Yahweh, onto Himself—the name by which Israel knew God. Jesus is of exactly the same substance as the Father, and Wisdom is an attribute of His exactly as it is an attribute of the Father and of the Holy Spirit. The lesson’s insistence that Wisdom is shown in Proverbs 8 and 9 to be creating, that to suggest that Proverbs 9:1 refers to creation week (“she has hewn out her seven pillars”) is simply fanciful imagining. The normal rules of grammar would never allow one to deduce that Proverbs 9:1 is about creation week and its seven days. This is the Adventist agenda superimposed on the text to make a point. “And I was daily His delight, Rejoicing always before Him, Rejoicing in the world, His earth, And having my delight in the sons of men” (Prov. 8:30-31). He was in the beginning with God. All things came into being through Him, and apart from Him nothing came into being that has come into being. Jesus is clearly described in John 1 as God and as the Creator. Wisdom in Proverbs 8 and 9 is present with God, but she is NOT God. She is an attribute of God. The lesson repeatedly calls Jesus “co-creator” with the Father. Scripture, however, clearly shows Jesus as the One who did the creating. To identify Wisdom as another name for Jesus is to be sloppy with the text and to ultimately downplay Jesus’ identity as God. The lesson’s point that, based on Proverbs 8:30-31, Jesus came to earth and established a relationship with his creatures as the mediator between the Father and creation is nonsense. Nowhere does Scripture imply such a thing. Nowhere. And certainly this passage not not suggest such thing, either. This passage indicates that all heaven, indeed, all of God’s creations (such as the angels) and God’s own heart, rejoiced in humanity—but not because they were “special” because of who they were. Rather, they were created in God’s image. It was their reflection of their Creator that caused Wisdom to rejoice in humans. God did not establish a relationship with humans on the Sabbath. Furthermore, God didn’t stop work for a day, as the lesson suggests, in order to admire His work. God CEASED working after the sixth day because He was done. He is not a “humanoid” to whom we can ascribe human reactions and purposes. We have to take the actual words of Scripture and know that they are telling us what God wants us to know. It is not our prerogative to imagine how God felt or why He did what He did. What He has told us we must believe, and we must not add to what He has told us by speculating what else might have happened. God created Adam and Eve, and the Sabbath was not part of the creation account. The seventh day upon which God CEASED to work is there, but there is no mention of His meeting them, commanding them to rest, or otherwise making “special time” for Him and them. On top of those concerns, there is utterly NO reason in Proverbs 8 and 9 to conclude that God established a relationship with His creations on the seventh day, nor is there any hint—not in Proverbs nor in any other place in Scripture—that Jesus received a new identity at creation, the identity of Mediator. Revelation tells us Jesus is the Lamb slain from the foundation of the world; His mediatorial work has always been His role and identity, but coming down at creation and interacting with the humans was not part of that work. Jesus MADE humanity. The Father didn’t oversee creation and then send His son to mediate His love and pleasure and joy. Such a fantasy clearly places Jesus in a position as God’s emissary, not as God Himself. Moreover, Genesis gives us no idea that it was God’s lesser side-kick that walked with Adam and Eve. It says that God walked with them. We have to read that to mean—God. And God is a Trinity: a Father, Son, and Holy Spirit. He is not three separate beings. He is ONE being expressed in three persons. The Trinity is a mystery we cannot understand, but we decimate Scripture when we try to explain it in terms that we understand. This lesson subtly underscores Adventism’s identifying Jesus as Michael the archangel. It seeks to make Proverbs 8 and 9 to be promoting Sabbath, attempting to equate Jesus with the personified Wisdom, and it teaches that Jesus became the Father’s mediator to humanity when he (Wisdom) came to earth at creation and delighted in the sons of men. These conclusions are not supported by the text. If one reads the words using normal rules of grammar and vocabulary, one cannot arrive at the conclusions the lesson draws. The Adventist hermeneutic which depends upon Ellen White’s commentary of Scripture is the source of the spurious interpretations put forth in the lesson. The unwary Adventist reader will “spiritualize” these proverbs and miss the richness and depth that are actually there. Wisdom IS an attribute of God, and it is an attribute which we are utterly unable to access apart from knowing Jesus. 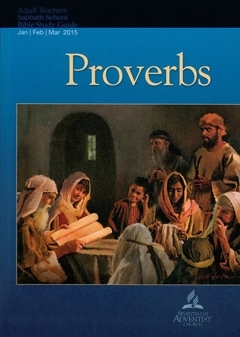 To the original readers of these proverbs, Wisdom would have meant—wisdom. It cannot mean something completely different to us. It still means wisdom, but because we know Jesus and His death for our sin, His burial, and His resurrection—and because we have His word, we know that, according to 1 Corinthians 1 and 2 it is impossible focus mohave true wisdom apart from knowing Jesus as our Lord and our Savior. When we believe in Him and place our faith and trust in Him, we are sealed by His Holy Spirit of promise (Eph. 1:13-14), and we then have His wisdom in us. We then have the mind of Christ (1 Cor. 2:16). Wisdom in these proverbs is—wisdom. But we, knowing Jesus and His finished work, now understand that to have wisdom is to know Jesus. There is absolutely nothing here that permits us to see Sabbath or Jesus as an angel nor as someone God sent at creation to mediate between him and us. These fanciful ideas are pure speculation born out of the worldview created by Ellen White and her great controversy paradigm. Ultimately there is only one reliable way to interpret Scripture: we have to use the normal, grammatical rules of interpretation that we use with any book. We cannot take the words and “spiritualize” them to suggest things that are not in the text. We have to treat the Bible as God’s own word, holy and living, which He directly inspired His prophets and apostles to write. To do anything else is to trample God’s personal revelation to us. Copyright 2015 BibleStudiesForAdventists.com. All rights reserved. Revised January 19, 2015. This website is published by Life Assurance Ministries, Camp Verde, Arizona, USA, the publisher of Proclamation! Magazine. Contact email: BibleStudiesForAdventists@gmail.com.